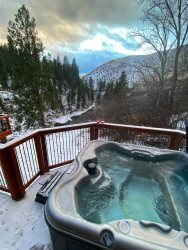 Here at Idaho Vacation Cabins we offer various specials throughout the year to make it easier to stay with us! See below for our current specials. Some specials will pop-up when you are booking, others you will have to contact us directly. Be sure to ask about our "E-Z Pay Plan". You can put 20% down at booking and make up to six months of equal payments. All balances must be paid 30 days prior to your arrival date. 7th Night is Always Free! When you stay with us,your 7th night is always free. Make it a week and enjoy your last night on us! Active Duty Personnel Discount 10% - Must submit proof on booking. 3rd Night Free - May not apply to all properties. Not valid on Holidays. Sep-Dec Call for dates. 3rd Night Free - May not apply to all properties. Not valid on holidays. Jan through May - Call for exact dates.